Oh cheesy goodness. And done without an oven at that. It all started with a craving for mac and cheese. Isn’t that how it always goes. You have a craving for something and then BAM there you go finding all the ingredients and making a big pan of the meal you want. We compromised though, I let us eat carbs and cheese as long as we could add vegetables. I’m gonna say this is half a win, because we should have put more broccoli in (in my opinion) but we’ll see. Next time I suggest adding spinach, too. We’ll see how far I get with that idea…. And I have to say, it came out pretty darn good. Cook pasta al dente, drain, and set aside. In a saucepan, melt the butter. Whisk in flour, mustard powder, salt, and pepper. Keep stirring for five minutes. 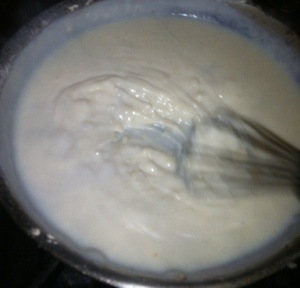 Make sure it is free of lumps and add milk and onion. Simmer for ten minutes, still stirring. Temper in the egg. 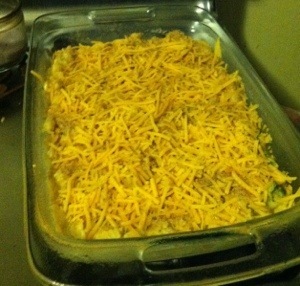 Add about 3/4 of the cheese and broccoli and mix until melted into the mixture. 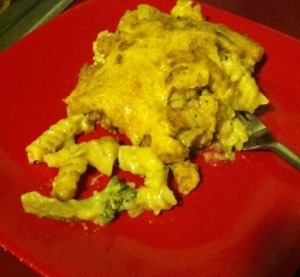 Fold in cook macaroni and pour into a lasagna pan. 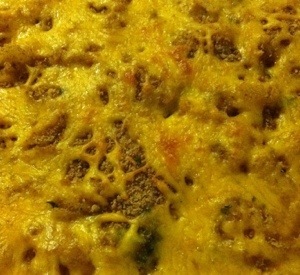 Top with remaining cheese and breadcrumbs. Cover with aluminum foil and place into oven. Bake for 20 minutes. Remove foil and bake for an additional 10 minutes on low broil or until top is golden brown and cheese is melted. Remove from oven, let cool for 20 minutes, serve, and enjoy.